A few weeks ago I had some extra free time, so I decided it was time to for the annual Pug Film Fest, where I present to my pug Chi Chi movies that I really like. Last year, Chi Chi the pug and her friend Pippin the Chihuahua-Corgi were the audience for 1972’s Enter the Dragon, featuring John Saxon, Jim Kelly, and the great Bruce Lee. Enter the Dragon Part 1: I painstakingly (and possibly painfully) recap the movie. Enter the Dragon Part 2: I talk A Lot about the movie. This year, I decided to continue the Hong Kong Action Movie theme with a double bill: 1993’s Eagle Shooting Heroes and 1994’s Ashes of Time (more specificaly, Ashes of Time Redux, a new cut of the film.) I’d recently picked them up on DVD and had been looking for an excuse to watch them back-to-back. Chi Chi the pug and our new puggle, Peanut, were happy to view them with me, kicking off Pug Film Fest 2014. The backstory of these two movies is somewhat unusual. 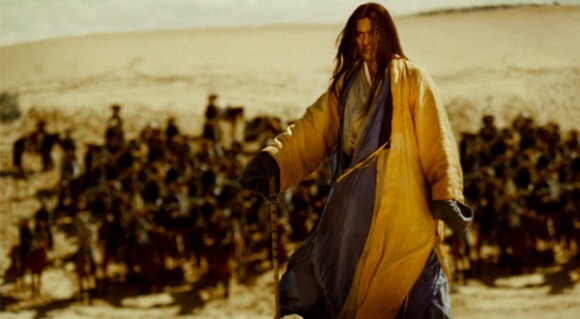 In the early 1990s, director Wong Kar Wai was filming a moody, atmospheric story loosely based on the characters in Jin Yong’s martial arts epic novel, the Legend of the Condor Heroes. 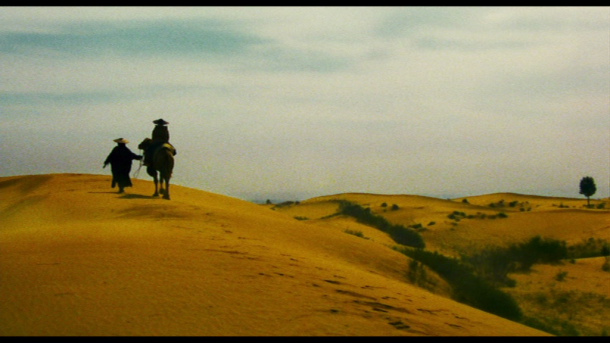 The film (Ashes of Time) was running over budget, and because of its arty nature might not recoup the investment. To resolve this financial problem, Wong Kar Wai produced a second film (directed by his protégée Jeffrey Lau) at the same time, using the same cast, featuring the same characters (since it was also very very loosely based on Condor Heroes.) This film was a whacky farce, and was expected to make money as a Chinese New Year event movie. I’ve seen both movies on VHS (Ashes of Time has a slightly longer running time on my VHS copy, and there are a few other small changes) but it was a joy to see them again. This isn’t going to be a spoilery review, I’ll just give some broad details. There Must Not be Spoilers! The Eagle Shooting Heroes follows the villainous Ouyang Feng’s attempt to overthrow a kingdom and rule it with the king’s treacherous wife (who happens to be Ouyang’s cousin.) The king’s daughter escapes to seek allies, with Ouyang in pursuit. What follows becomes a Shakespearian comedy of unrequited love, jealousy, oaths of revenge, suicidal beggars, and dangerous misapplications of poison. Also drum-sensitive centipedes and the anatomy of immortals. I have not read The Legend of the Condor Heroes, but I assume there’s not much in common between the book and The Eagle Shooting Heroes. Where Eagle Shooting Heroes is crazy and fun, Ashes of Time is slowly paced, moody, and depressing. The villainous Ouyang Feng is living at the edge of a waste, seemingly running a tavern or an inn, something like that. He apparently makes his living being a middleman between people who want someone killed, and someone so desperate that they’ll do the killing. The movie follows a handful of his clients, and how their stories weave and interact, along with the slow reveal of what painful secrets their past holds. It’s great. I can’t recommend it enough. 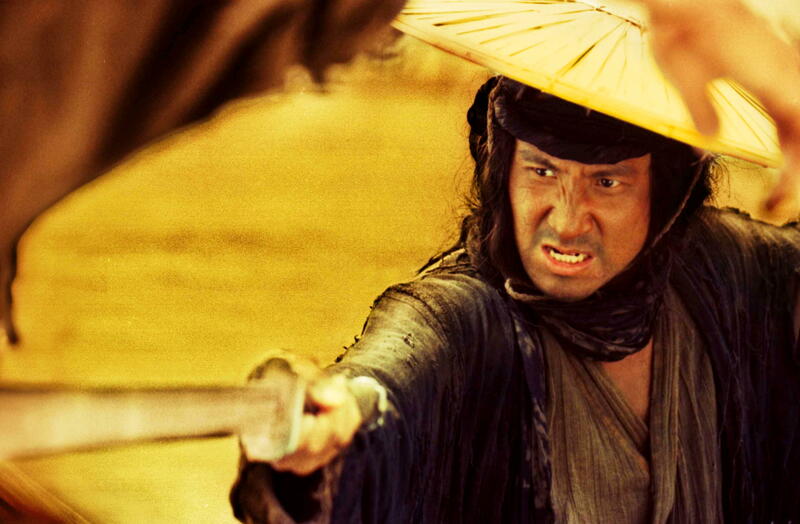 It’s not quite an action movie, although there are fights, dramatically and artistically shot. The blind swordsman’s fight against a seemingly endless number of bandits was a stand out. I mentioned that Wong Kar Wai (as director of Ashes and producer of Eagles) used the same cast for both movies. Both films feature largely the same male characters, but interestingly (except in one case) actors swapped roles. In The Eagle Shooting Heroes, Leslie Cheung plays the virtuous Huang Yaoshi, but plays venomous Ouyang Feng in Ashes of Time. 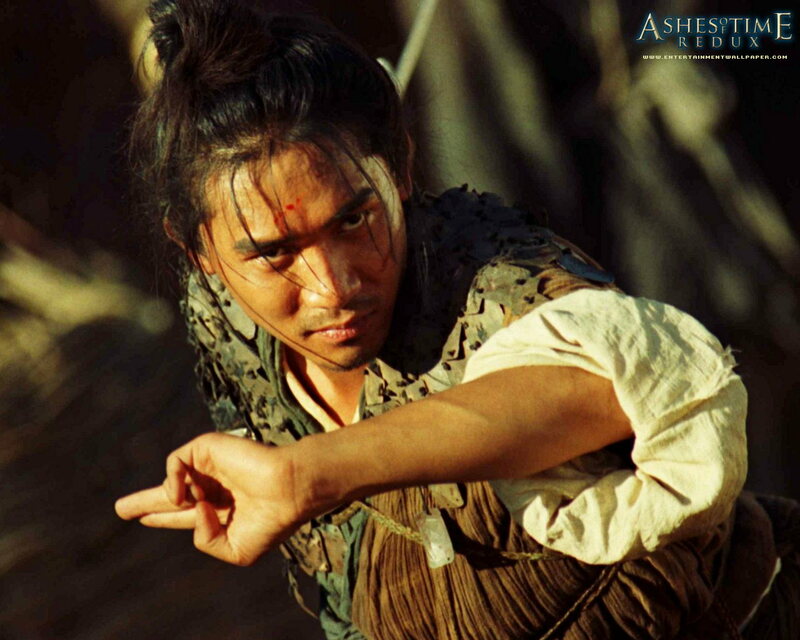 Tony Leung Chiu Wai plays the evil Ouyang Feng in Eagle Shooting Heroes, but in Ashes of Time, has the nameless role as a heroic blind swordsman. Tony Leung Ka-Fai is the spirited Immortal-wannabe Prince Duan in Eagle Shooting Heroes, but plays the not-quite-as-virtuous Huang Yaoshi in Ashes of Time. There doesn’t seem to be significant crossover between Eagles and Ashes in regards to the female roles, but I’m delighted to feature them. Brigitte Lin is the action-initiating Third Daughter (of the besieged king) in Eagles, and plays the enigmatic and mysterious Murong twins in Ashes. 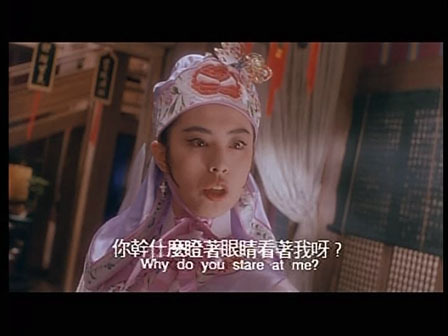 Carina Lau is the gender-bending Zhou Botang in Eagles, and is the blind swordsman’s wife Peach Blossom in Ashes. Maggie Cheung plays the Imperial Master in Eagles (although in my copy she’s referred to as the Sorceress), and is Ouyang Feng’s sister-in-law in Ashes. Ashes of Time features Charlie Yeung as the beautiful Girl with a Mule. I don’t want to minimize her importance in the story, despite her not having a proper credited name. In many ways, she’s the soul of the movie. Joey Wang, who plays Suqui, Huang Yaoshi’s sweetheart and Hong Qi’s betrothed in Eagles, apparently had a role in Ashes of Time but her part in the story was edited away. That bums me out, since I loved her role opposite Leslie Cheung in the Chinese Ghost Story movies. Sadly, finding a picture of Li Bai in Ashes of Time was too much of a challenge for my Google Fu. Both movies have complicated romantic entanglements, although Ashes of Time‘s situations are much more serious. The combat in Ashes of Time is much more serious as well, but fights in Eagle Shooting Heroes are crazy fun. It’s the kind of action flick where the combatants shout out their signature moves. Stuff blows up. There’s TOAD STYLE Kung Fu in Eagles. The fights in Ashes, by contrast, are very stylized but hard to follow. Sammo Hung was the fight choreographer, but the final edits of the action are unlike any Sammo fights I’ve seen. I’ve heard Ashes of Time called an inaction film for that very reason, but the details of the fights are not as important as the reasons for them, or the outcomes. This is one of those times where the destination is more important than the journey. Okay, I’m not really reviewing the movies per se (everyone should just go watch them) but I wanted to make some observations on Ashes of Time, my favorite of the two films presented at Basement-Famous Pug Film Fest 2014. This is one of those movies with minimal dialogue, so every line is very important. I really dug that. Although the story was not immediately clear, due to the non-linear fashion, reliance on flashbacks and implication, it’s overall coherent and solid. I’m totally using the word “coherent” because that’s all I hear from film critics. Although I usually hear “incoherent”, because they’re, you know, critics. Not everyone might have followed the movie’s plot as easily though. Say My Name. Or Rather, My Description. I know I read a review that talked about there being two blind swordsmen in the movie, completely missing the fact that there’s only one. Even though the story is understandable (even if inferences have to be made, and it’s really a moody atmospheric slice of life movie) there are questions that I feel would drive a great discussion. Did the Mule and Egg Girl go fetch a doctor to help in Hong Qi’s recovery? 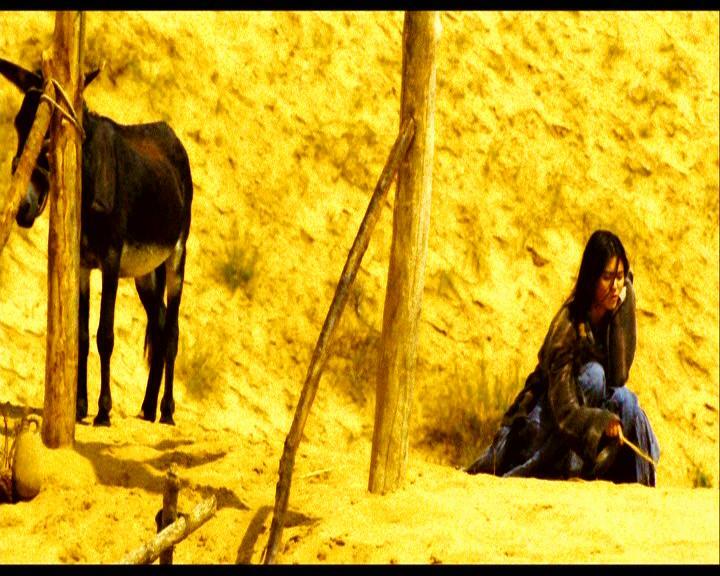 Mule Girl represented a level of virtue that Ouyang Feng couldn’t appreciate. His advice for her was to simply to trade her body for assassins to kill the militamen who killed her brother, and when Hong Qi was willing to do the job for an egg, Ouyang’s advice was to drop guilt on her to seduce a doctor into treating Hong Qi afterwards. It’s unresolved in the movie. Mule Girl leaves, Ouyang Feng remarks that he never sees her again, and a hale and mostly whole Hong Qi prepares to seek martial arts fame, accompanied with his wife, with his 9 remaining fingers. Did he recover on his own? I tend to think otherwise, that Mule Girl was willing to break her rules to match Hong Qi’s sacrifice for her. Did Ouyang Feng kill his brother the evening of the wedding? We know Ouyang Feng tried to convince the bride to leave White Camel Mountain (and his brother) but she refused and he raped her. But the brother is never mentioned, there is no reflection on if they would meet when Feng eventually returns to the mountain. We know that Huang Yaoshi was a frequent visitor and go-between between Ouyang Feng and his former lover, and that Huang loved her as well, but there is no evidence of her husband. My assumption is that Ouyang Feng killed him. Is Ouyang Feng’s nephew actually his son? I don’t even know if I can call him nephew. We just know that Maggie Cheung has a son with annoyingly similar traits to Ouyang Feng. “He does not ask for what he wants, he waits until it is offered” is a similar sentiment to Feng’s sister-in-law’s complaint that she opted not to marry Ouyang Feng because he had never asked. If the son is simply Feng’s nephew, that’s not as interesting, and would have been a reasonable thing to edit out. But added in the scene where Huang Yaoshi is visiting the boy’s mother, it adds weight to her motivations on turning away from Feng for his brother. Peach Blossom loves to wash her horse in the river at night. Huang Yaoshi is certainly The Player. He seduced Peach Blossom, drove Murong Yin crazy with his attention, and was known to spend a lot of time with Ouyang Feng’s sister-in-law. Okay, I assume nothing was going on there, but he was the handsome ladies man overall. I’m surprised he didn’t hook up with Mule Girl or have been revealed to have had an affair with Hong Qi’s wife. It seems odd to me that Hong Qi couldn’t pay for a house-call from the doctor. He had 10 silver taels from destroying the bandits. Speaking of bandits, shouldn’t the militia have taken them out? 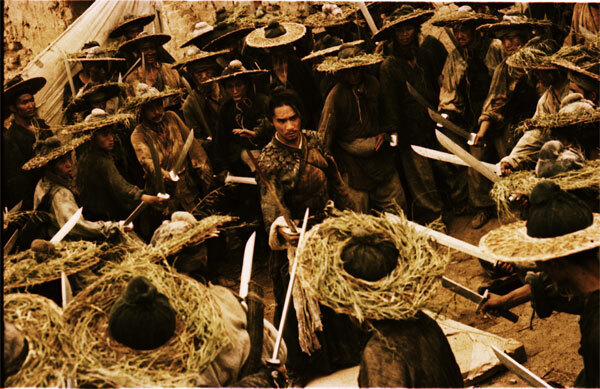 Since Hong Qi destroyed the bandits but was injured in the fight with the militia, the martial-arts pecking order implies that the militia could have taken care of the bandits. Of course, since the militia was corrupt, it’s not that much of a mystery. I only bring it up because when I first saw the movie, I assumed the bandits and the militia were the same group. Okay, I’m wrapping up my overview of The Eagle Shooting Heroes and Ashes of Time. Have comments? Feel free to leave them. Images from The Eagle Shooting Heroes and Ashes of Time Redux. 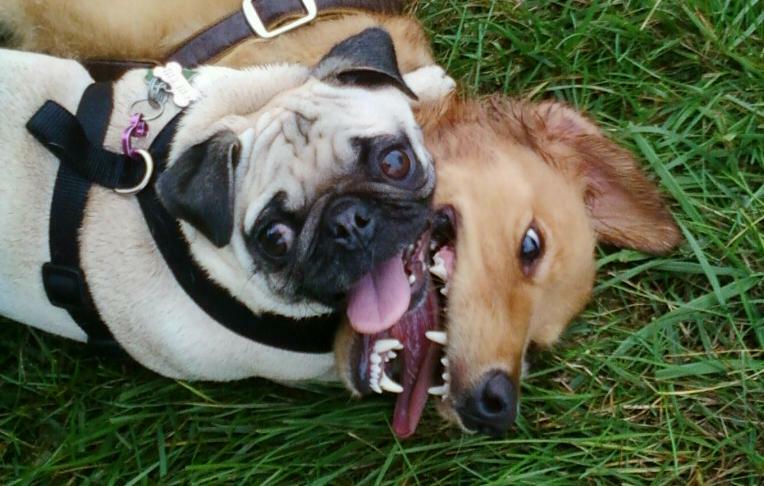 Except for that picture of Chi Chi the pug, assaulting one of her doggy friends.